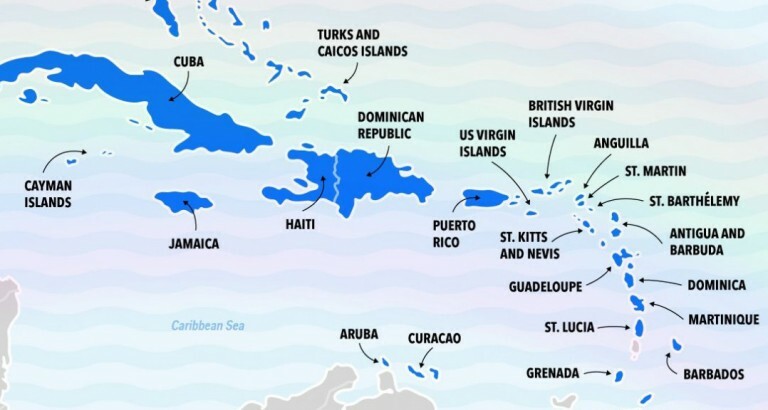 The Caribbean is a true paradise for sailors. An average temperature of 30 ºC, constant wind of 15 knots and a water temperature of 25-28 ºC offer perfect sailing conditions all year long. The small distances between the islands allow for short sailing trips of 2-3 hours. You can explore blue lagoons, wonderful beaches and exotic landscapes from the sea. Sounds amazing, right? Renting a sailboat or catamaran is fairly uncomplicated in the Caribbean. You don’t even need to have a sailing license! It is enough to have proof of having experience in sailing of similar charters before. 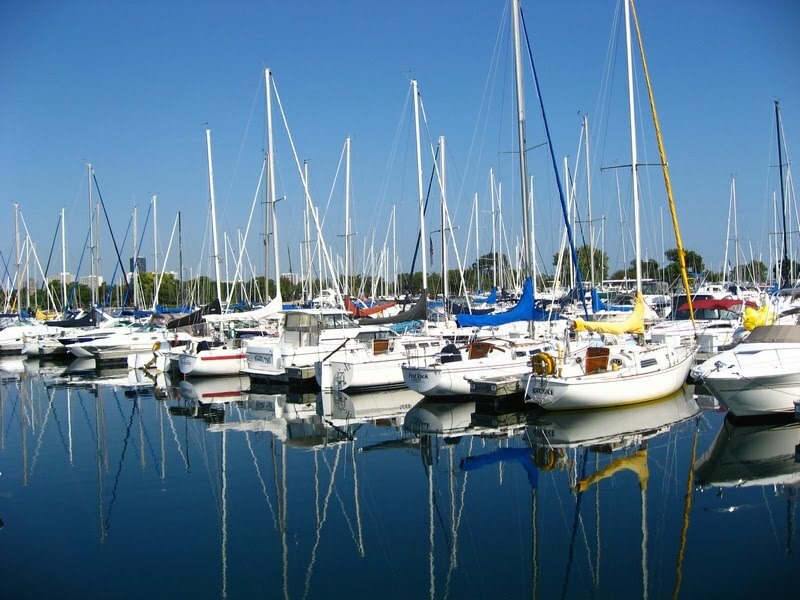 If the proprietor approves them, you can generally rent any kind of sailboat. There are so many Caribbean islands, that even connoisseurs make some new discoveries each time. If you want to explore the southern Lesser Antilles, we would recommend to start on the island of Martinique and sail up to the Grenadines. Since you are often travelling through various counties when sailing in the Caribbean, it is necessary to pass through custom control as well. If you are not going ashore and only anchor in the bay, it is enough to raise the yellow flag, which stands for Transit. If you like variety and exploring different beaches and harbours, the following route was made for you! You will arrive at the airport Aimé Césaire on the island of Martinique. As soon as you have got your suitcases you can make your way to the port Le Marin, which means “the sailor” in French. You can check-in aboard and familiarise with yourself the equipment of the boat. Make yourself at home! To provide your boat with food and drinks for your journey, visit one of the supermarkets in the harbour. Afterwards, if you have booked a skipper for your boat, discuss your plans for the sailing route with him. Since they know the territory very well, their recommendations are worth considering. Once everything is set, get yourself a nice aperitif and enjoy your first Caribbean sunset. Which one of these boats will you sail? Today, your exciting journey starts! Start your day early and set sail in the direction of Santa Lucia. After around 4 hours of sailing, which are roughly 31 nautical miles, you reach the famous Rodney Bay. Anchor and enjoy the crystal clear water by going for a swim. Subsequently we sail a bit further along the coast of Santa Lucia until we have reached Marigot Bay. Have dinner aboard and stay for the night. After breakfast with an exceptional view on the beautiful rockbound Marigot Bay, we set sail in the direction of Bequia. This will take about 8 hours, so 60 nautical miles, and leads us past the islands of Santa Lucia and San Vincente. Although the coastlines are lovely to watch, you might even be lucky enough to spot flying fish, dolphins and whales at sea. 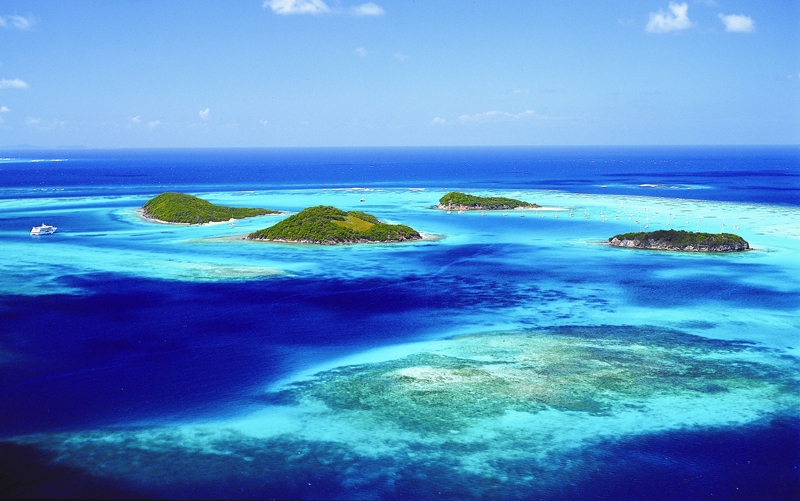 In the evening you will reach your final destination – the Grenadines. This island was famous for its whale hunt, and many museums are still reminiscent of this old tradition. We anchor in the bay of Admirality, where the capital of the island is situated. After the necessary customs checks, set foot on the island and find a nice restaurant to go to for dinner. Try one of their local culinary specialities, such as the delicious grilled fish. Have a wonderful evening! This day will start by setting sail to the destination Mustique, which will take around 2 hours. 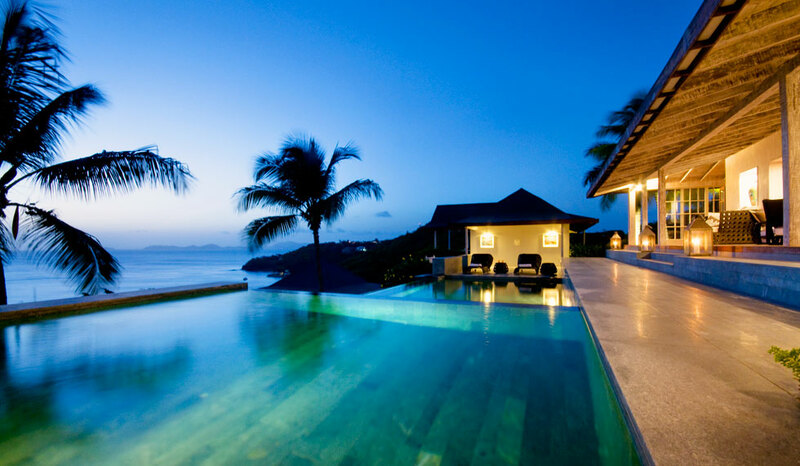 The island Mustique is also goes by the name Island of Billionaires, as many billionaires hold premises there. Since the 1960ies the whole island is privately owned by a wealthy Scotsman. Be sure to have enough provisions aboard, as this island doesn’t really provide shopping possibilities. Exploring the island you might walk past the mansion of Mick Jagger and you can let your day come to a relaxing close in the exclusive Cotton House Spas. After a rich breakfast on Mustique we sail further on in the direction of Mayreau, which takes about 2.5 hours. Once you have arrived, you will anchor in one of the most beautiful beaches along our route. 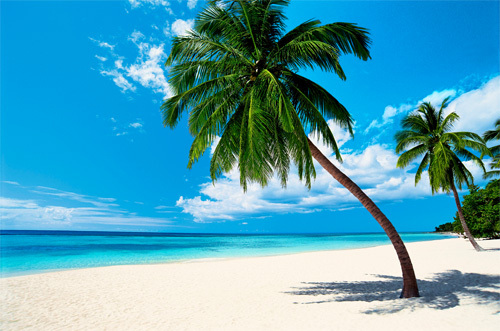 Salt Whistle Bay is a stunning white sand beach, with tall palm trees full of coconuts. Be sure to take pictures, so that this wonderful destination will stay in your memory. On this paradisiac island you will have the chance to try delicious fresh king prawns for dinner. To top off your day, take a stroll to the city centre to marvel at the incredible panorama of Tobago Cay – our next destination. At dawn we are already setting sail to Tobago Cays, where you will arrive in less than 2 hours. This group of island looks so unreal, it seems like a wallpaper. White sand beaches, crystal clear turquoise water, coconut palm trees, a bay full of exotic fish and turtles – all of this awaits you. Be sure to pack your snorkel equipment and dive into the stunning underwater world. On day 7, you will steer to the nearby island Petit Tabac. Although the island is small and rather unknown, it is definitely worth a visit. The movie Pirates of the Caribbean was shot in the islands of Grenadines and one scene was particularly shot on Petit Tabac. 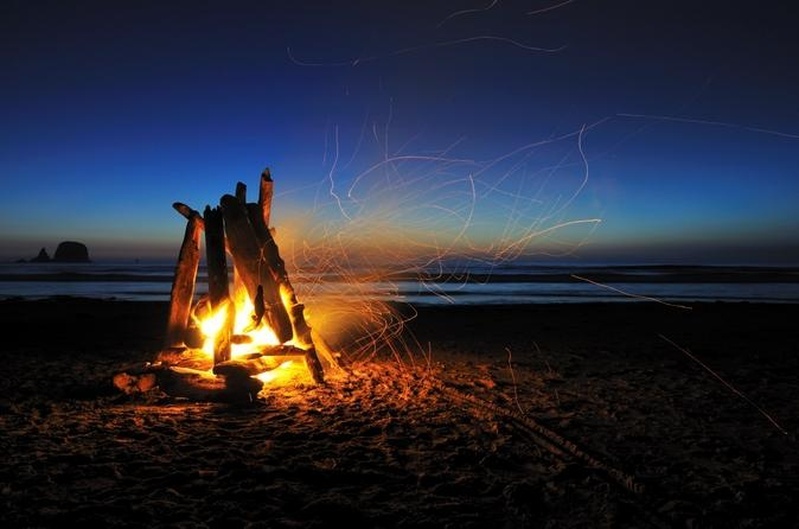 It is the scene where Captain Jack Sparrow and Elizabeth Swann run ashore on a deserted island and stay the night drinking rum next to a bonfire. Maybe that sounds like a good plan for you too! On day 8 set sail to the southern part of the Lesser Antilles, to Morpion. After around an hour of sailing you will reach your destination. Have lunch on Palm Bay and enjoy a swim in the bay. Afterwards, set sail again to Union Island known as the main island of the Grenadines. Stock up on your provisions there and fill up your water tanks. 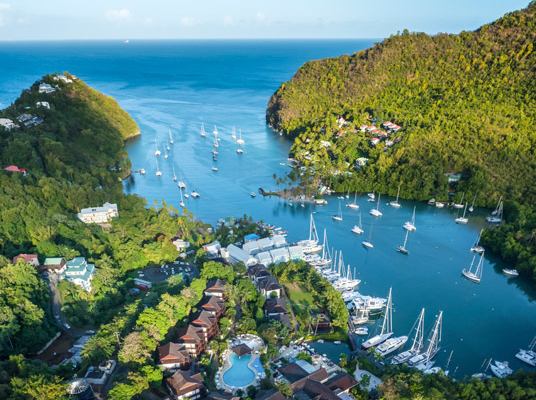 Spend your evening in Clifton harbour, where you can have dinner and dance the night away to Caribbean rythms. On your penultimate day you will take a longer route on the sea. 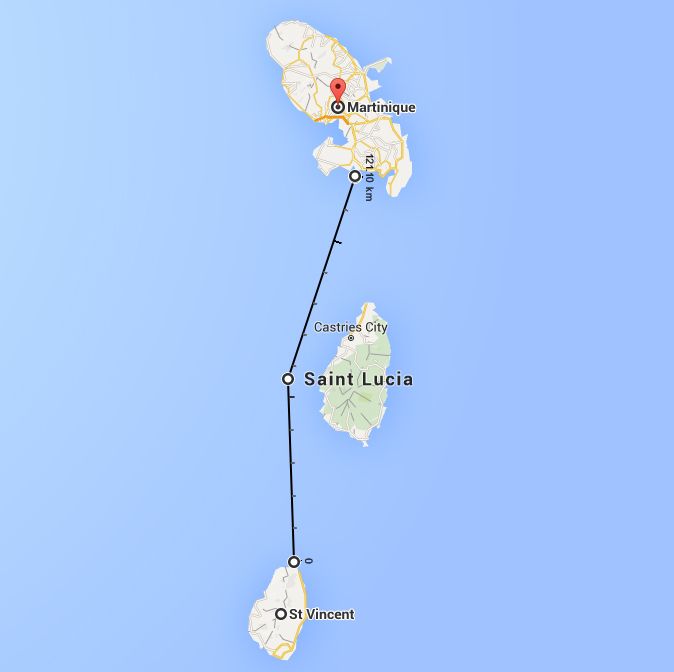 We sail to San Vincente, which takes around 6 hours, and leads past the rather unfrequented island Canouan. Keep on sailing to Martinique, where you will reach Cumberland Bay in the afternoon. Anchor in the style of the tahitians there, next to a palm tree. The local boat boys are sure to help you with this maneuver and the customs formalities. Once you have gone ashore, take a 5-minute walk to the waterfall located in a beautiful oasis. Afterwards we will sail at night again, to arrive in Martinique in the morning. After around 9 hours, you will reach Martinique in the morning and need to fill up our water tanks. Alternatively you could also sail during the day and drop off your boat in the late afternoon. If you arrive in Martinique early though, you still have the great opportunity to spend your whole day in Martinique. Have a nice breakfast or lunch, buy some souvenirs, or rent a car to really explore the whole island. After a wonderful last day and lots of memories from your sailing journey, say goodbye to your boat. 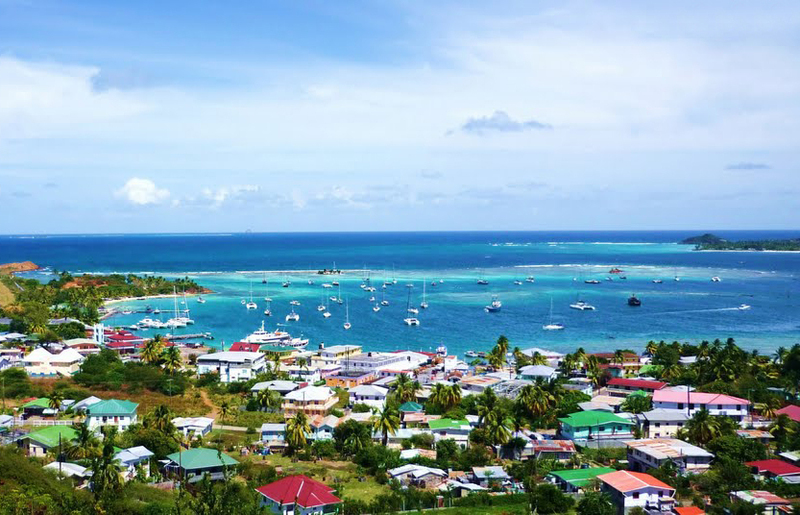 If your heart already aches at the thought of leaving, think about the possibility to come back next year and sail the northern islands of the Lesser Antilles. Have you been on the Grenadine islands before? What are your favourite destinations? We would love to hear your stories!